In 1931, Dr. Yoshio Nishina’s laboratory was established in RIKEN. For almost 80 years since then, RIKEN has continued to promote accelerator-based science in Japan and maintained its position as the world’s front runner in the field. In 2006, a significant milestone was achieved when the RI-beam factory (RIBF) with its world’s first superconducting ring cyclotron, SRC, and superconducting RI-beam separator, BigRIPS, started a full-scale operation. RIKEN Nishina Center for Accelerator-Based Science was established the same year to comprehensively promote accelerator-based research at this world-class top performing facility. The primary mission of Nishina Center is to unravel the mystery of the genesis of the elements by investigating the nature of nuclei and their constituents, elementary particles. The center also aims to explore the potential industrial application of its research on nuclei and elementary particles to agriculture, medicine and other such fields. Incorporating RIKEN’s strength as a multidisciplinary research institute for natural science, Nishina Center promotes a wide range of cutting-edge research and development, a path pioneered by Dr. Nishina in his days. 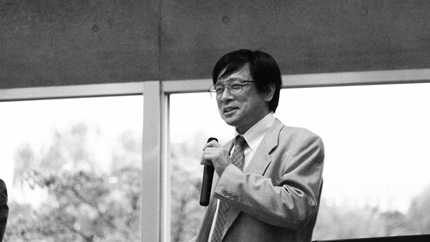 Nishina Center was named after him to honor the spirit of this great scientist. The completion of RIBF heralds a new era in the field of nuclear physics. By producing a large number of unstable nuclei, studying their properties and finding the ultimate picture of nuclei, we will be able to uncover the process by which the heavy elements were formed in the universe. The powerful heavy ion beams will not only be used for nuclear physics research but also for various applications purposes. Since the new capabilities of RIBF will broaden the research potential immensely, Nishina Center will commit itself to upgrading research environment and operation system of RIBF for the worldwide users to achieve outstanding results. Your continued cooperation and support would be greatly appreciated.